I’ve got to admit to being a beach baby…maybe it’s because I grew up in a land-locked country, I just love being by the sea! 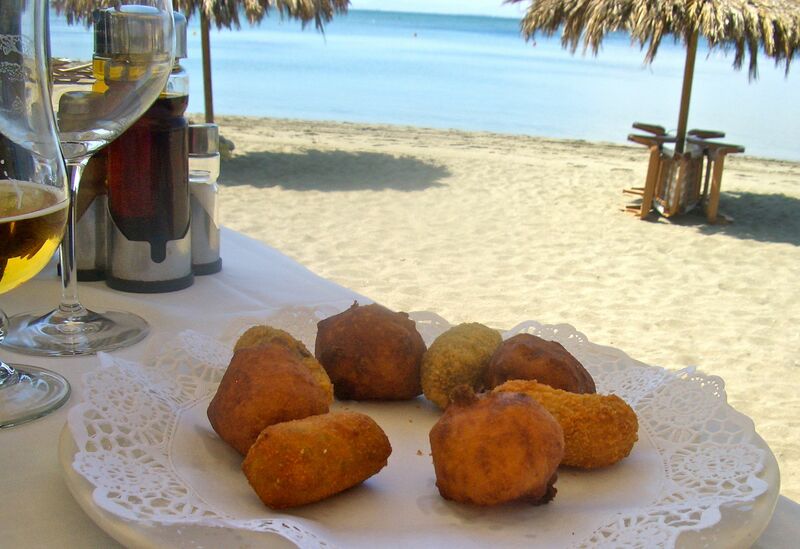 And a restaurant on the beach, now you’re talking – Escuela de Pieter is the place for me! It’s along the La Manga strip, a long sleeve (manga means sleeve in Spanish) of land with the lagoon of the Mar Menor on one side and the Mediterranean on the other (double sea views in places!). 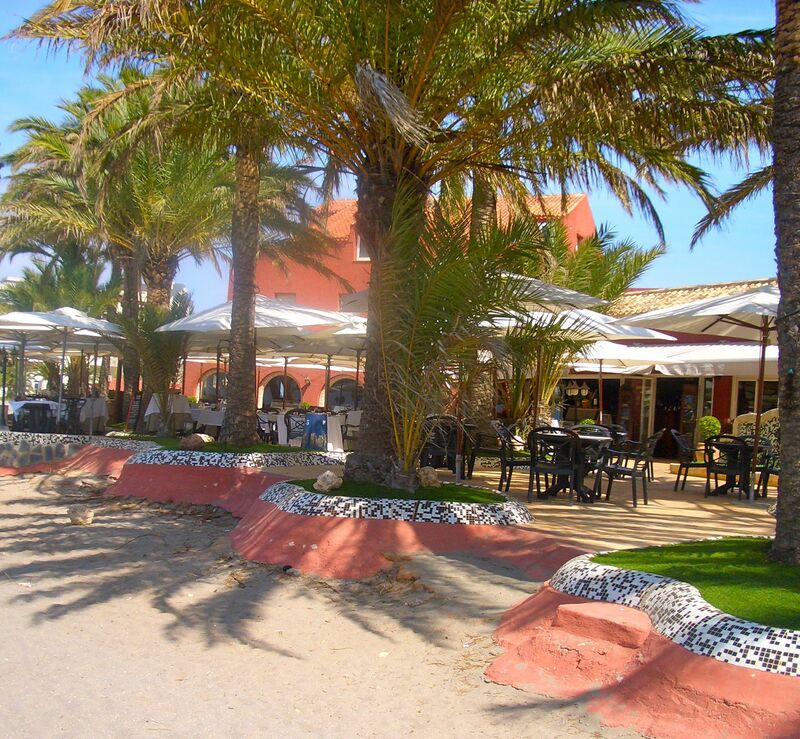 This big Spanish beach resort is packed with restaurants and bars and our favourite is Escuela de Pieter at the 17km marker on the strip (just in case you try to find it, the km markers are used as navigation aids and landmarks along this long piece of land). 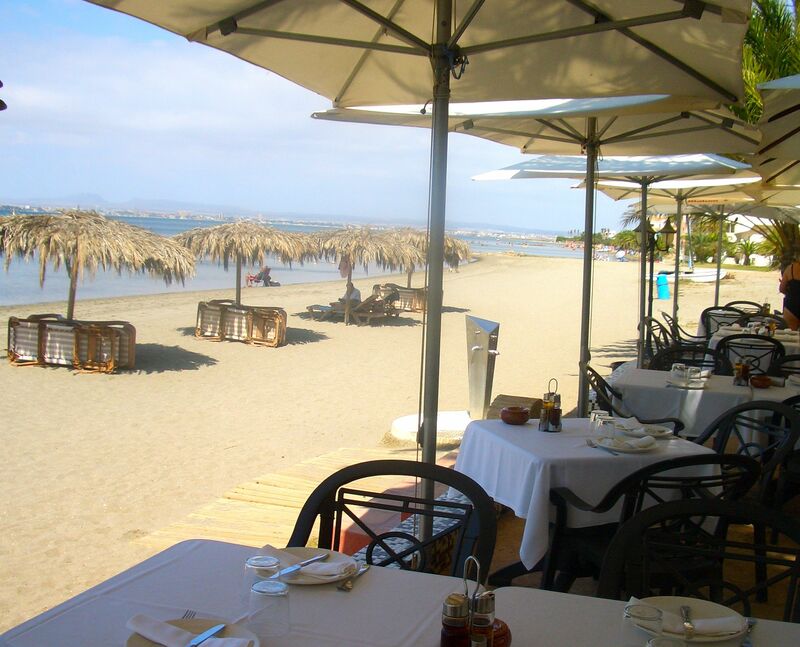 Sitting under palm trees on a beautiful little beach overlooking the Mar Menor – really, there aren’t many places I’d rather have lunch. And the food’s really good, too. 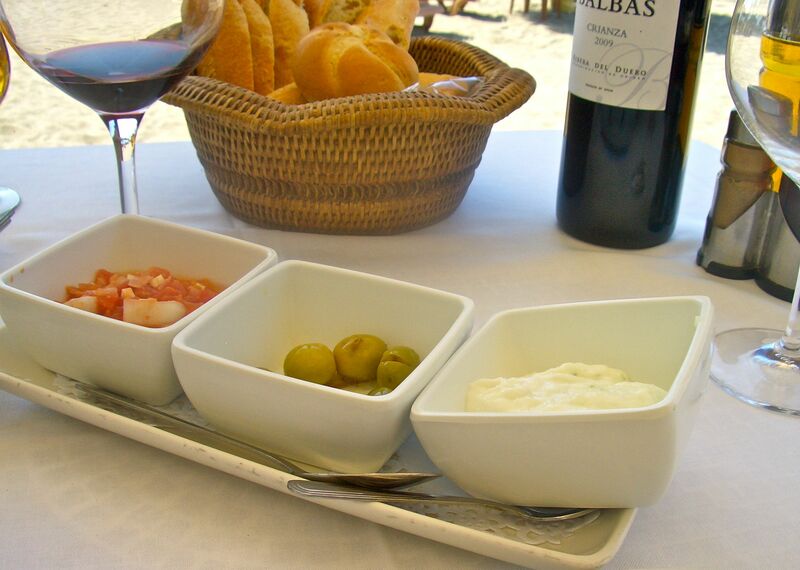 To start off with, bread and a tasty trio of Murcian salad (a surprising good combo of tinned tomatoes, hard boiled eggs, onion, tuna and olives), alioli (garlic mayo) and olives were brought to the table while we pondered our choices on the menu. Wine ordered, snacks arrived…life is good! We started with house croquettes and battered cod balls. They were beautifully succulent and the choux-type pastry of the cod balls was quite a revelation. A starter of amazing flavours and textures. Our fishy starter was perfect…and I just had to get the beach in shot, too! For main Terry went for the spare ribs in sweet and sour sauce with rice. All perfectly cooked, the rib meat fell away from the bone. 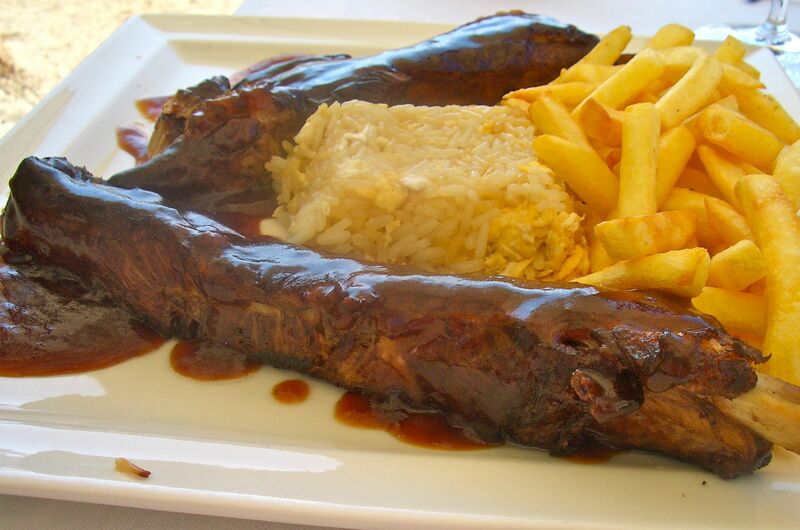 Ribs with the softest meat and luxurious sauce. And this is one of my favourite dishes ever! 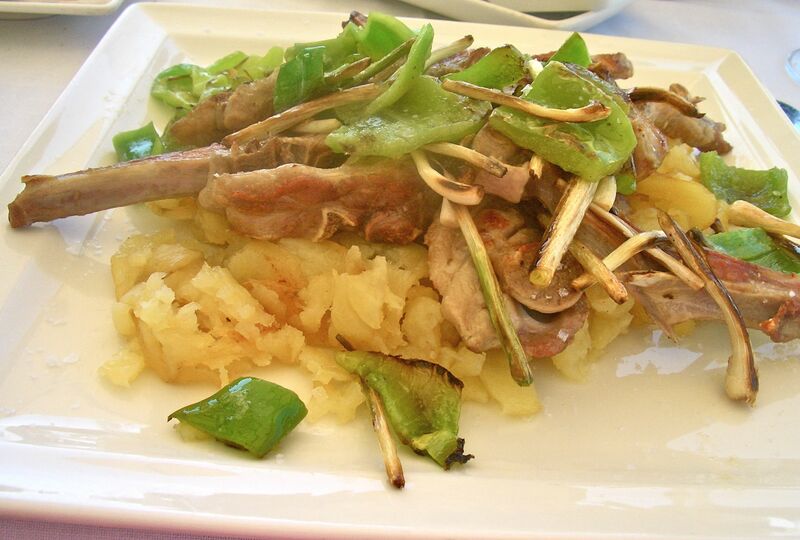 Baby lamb chops and fresh garlic, green peppers and potatoes. I don’t know quite how they cook these amazing potatoes, but they’re both soft and crispy and so tasty. The mix of ingredients is quite simply perfect. Could a restaurant look more welcoming? Sit down, order your wine and take in the view.